Although there were sanction on imports to Iran Germany dealt with Iran the last years. 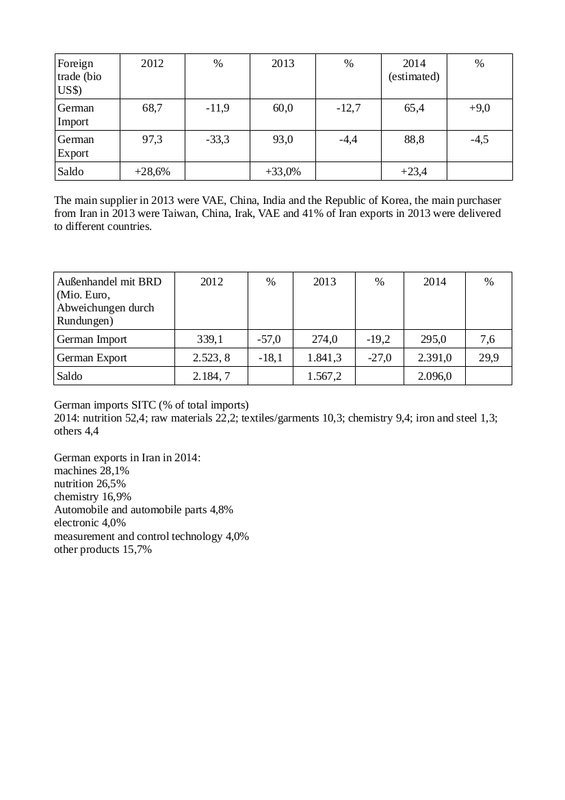 In the tablebelow you will find data from exports of Germany into Iran for the last three years. Companies which invests in Iran in the past were Nestle, Burckhardt Compression, the pharma corporate Roche, Swatch and Siemens. US präsident Barack Obama disposed that the lifting of U.S. nuclear-related sanctions described in sections 17.1- 17.2 of Annex V of the JCPOA will occur. Because of the sanctions Iran has a big demand of goods from Europe and the USA, especially in automobile, electronic and the mechanical engeneering. The lifting of the sanctions will be also very interesting for Bombardier. Bombardier wrote losses in the last years. The new CS series is a low noise aeroplane with less consume of kerosine. Bombardier has 243 orders. The calculation needs 300 orders until 2016. Among the purchaser of the new series of Bombardier is Russia, Suiss and Iran. Also needs Iran motors for its aeroplanes and rockets. 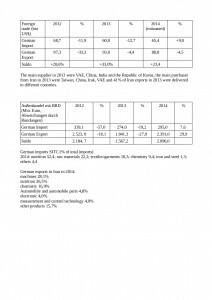 The inddustrial production decreased between 2011 and 2014 by 12%. But it will need time to restore old traderoutes, so HSBC. Morgan Stanley forecast a growth of GDP of 6% – 7% pa after lifting the sanctions. The oilproduction will increase. Without the sanctions Iran of today would be one of the 20st biggest economies globally, so HSBC. The biggest profiteur of the lifting of the sanctions against Iran will be Europe. 70% of Irans economy is state controlled, many big companies of Iran are under control of the Revolutionary Guards. So, if you want to make good business you need a good local consultant to find the right partner for business. Aslong as Iran has not implemented the payment system SWIFT the payment is also difficult because only few banks are able to make transactions with Iran. European companies who made business with Iran in history are Burkhardt Compression, the pharma corporation Roche and Swatch. In 2011 Iran imported 1,4 mio automobiles, 2014 Iran imported 0,9mio. The automobile manufacturers are waiting for the end of the sanctions, the supplier are following. Autoneum plans to invest in production facilities in Iran if the market need it. With lifting the sanctions the stock exchange in Iran will be develop. IMF estimates that the currency of Iran lost worth since 2012 by 80%. And the stock exchange in Iran is with 100bio $ not small. The influence of foreigners at the stock exchange is still very small, less than 1% of investments are from abroad. The Iran finance corporation Tuquoise offer an Iran fond. The average CER of Iran companies is 6. This is as half as expensive than the MSCI Index of emerging countries. But the biggest effect will be the implementing of the SWIFT payment system. 1 Euro = 30.366,000 Rl. 1 US$ = 28.085,000 Rl. 1 US$ = 26.019,000 Rl. 1 US$ = 18.544,000 Rl. 1 US$ = 12.260,000 Rl.